By Catholic Church U S.
A Catechism (which means "instruction") is an authoritative source for learning about the Catholic Church's creeds, sacraments, commandments, and prayers. 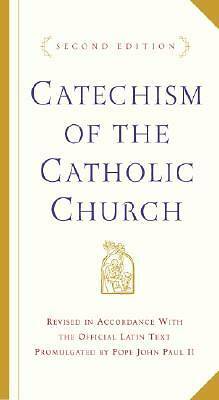 This edition of the "Catechism of the Catholic Church" is the complete official text approved by the Church and released in English in 1994. It is the first catechism in more than 400 years, featuring line-by-line explanations of every aspect of orthodox belief and "In Brief" summaries of each section. A meticulous index, extensive cross-referencing, and helpful footnotes enable readers to find precise answers to particular questions with ease. Even the layout of the information on the page is designed with the reader in mind, with wide margins for those who wish to make notes. Drawing on the Bible, the Mass, the sacraments, traditions, teachings, and the lives of the saints, this book elucidates what Catholics believe, celebrate, live, and pray. For all those interested in gaining a new or deeper understanding of the mystery of the Catholic faith, the coherent, and contemporary explanations in "Catechism of the Catholic Church" provide a complete map to the spiritual journey toward transformation. Slightly larger than the Image mass-market edition and bound in paper-over-board, "Catechism of the Catholic Church" is a durable, attractive volume for personal use and a wonderful gift for all Catholics. Author: Catholic Church U S.